Of course Kari had all manner of lightweight camping gear (stove, utensils, pots, tent, ground matts, etc.) 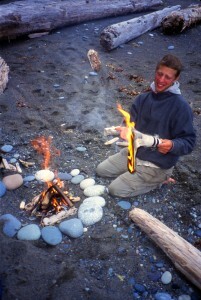 as well as insulated, easy dry clothing so essential for the West Coast even in mid-summer. All I had to do was follow her directions and fill in the missing parts for my kit. A day later, David and Jenn arrived from Montreal and shorty after that we hit the road. Lynn and Sean (he was then eight), dropped us at the trail Head in Port Renfrew and after a bite to eat they bid farewell and began the three and one-hour hour winding drive back to Victoria. We would be on the trail soon and I was nervous wondering if Kari may have dumped her Dad in over his head. 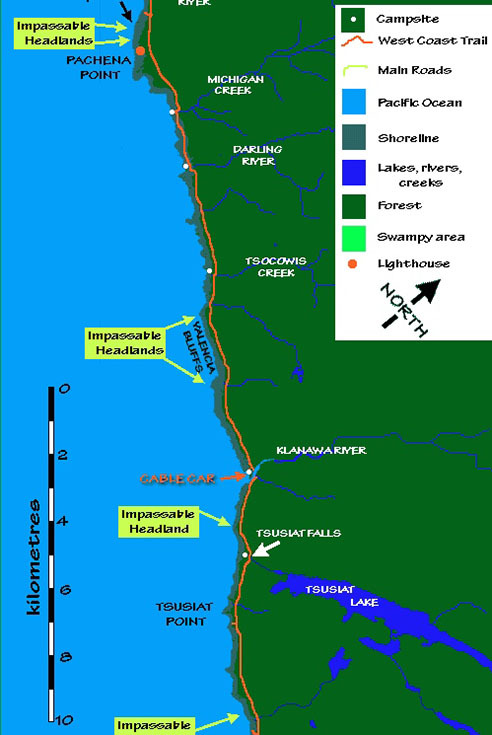 Map (Web Source): Link here for an excellent trek planning and longitudinal map provided on the West Coast Trail, Rules and Guidebook Website. A sectional copy of their map is included in the footer of this post for quick reference. 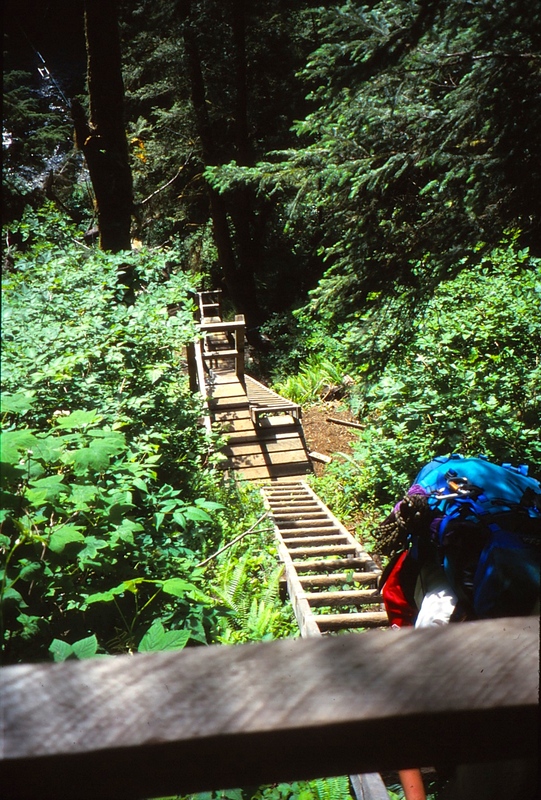 Over the decades, the West Coast Trail trail has worked its way into the Top 10 hiking trails in the world and while personal interest often dictates which trail is the best, the WTC is not one to be trifled with particularly if the weather turns ugly. If your first question about the trail is “what should I pack”, you had better consider one that is less demanding or get an experienced guide like Kari to keep you focussed and safe. Photo (Web Source). The Golden Hinde, Vancouver Islands highest peak at 2200 meters. 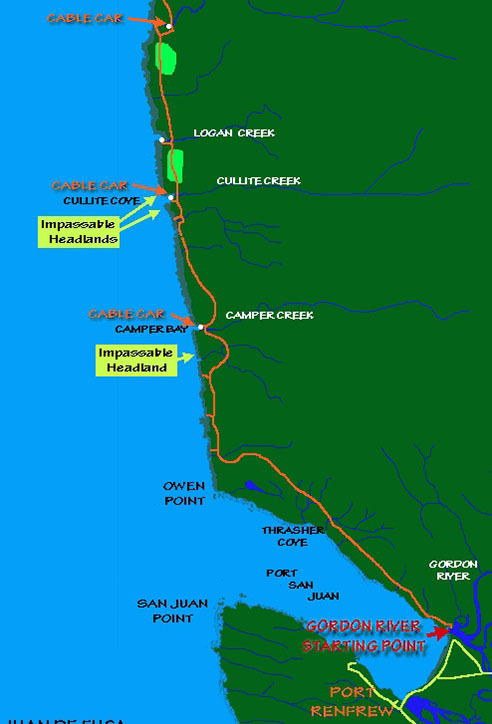 While the WCT is listed at 79 km, that distance does not take into account the dozens of challenges that must be faced along the route. While most hikers prefer seven to nine days, experienced hikers making a dash to the finish, could probably complete in three or four days. 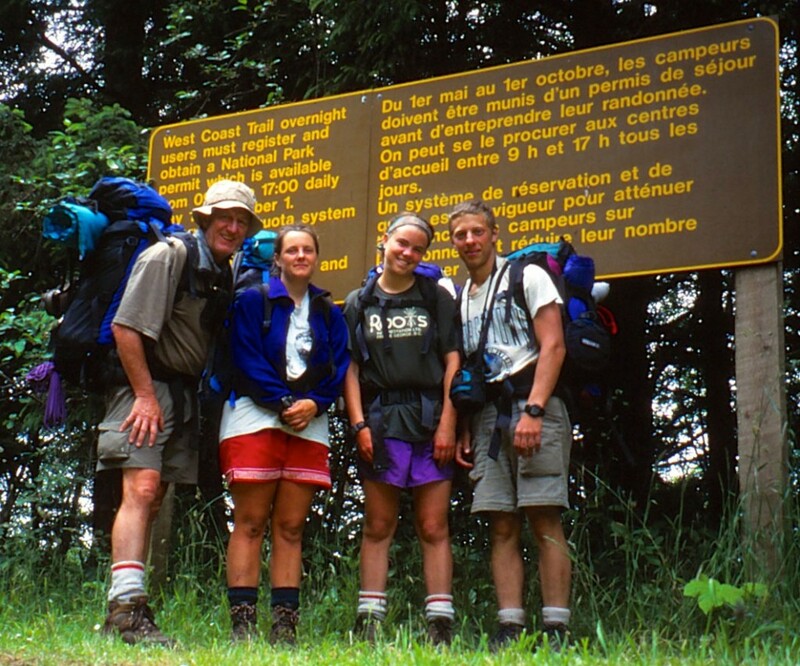 At the time of our departure, a half dozen young Canadian Military recruits entering on the same day as our group, intended to complete in just over two days. 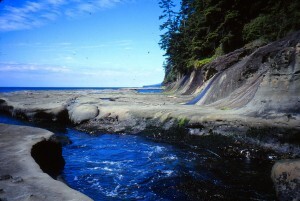 While some drive north and hike south, entering the trail at the south-west eand provides opportunity to visit the extraordinary display of sea life and rock formations at the Botanical Beach Provincial Park, a world renowned sea life sanctuary best viewed at low tide. As weather along the coast can turn on a dime even in summer, the number of days taken to complete a leisurely transit could easily wind up taking an extra couple of days if the weather turned ugly or low tides were missed. Speaking of tides, to enjoy the best the trail has to offer, a tide chart is essential in order stick close to the ocean and to experience each new vista as it opens around the next headland. The face one has to work extremely hard on this trail only adds to the pleasure. As it turned out, we were among the lucky groups who experienced exceptional weather for our full transit and while morning fog was not unusual, by ten or eleven, it was shirtsleeves and shorts particularly when climbing and descending ladders, mud bogging and stump hopping in the rain forest. 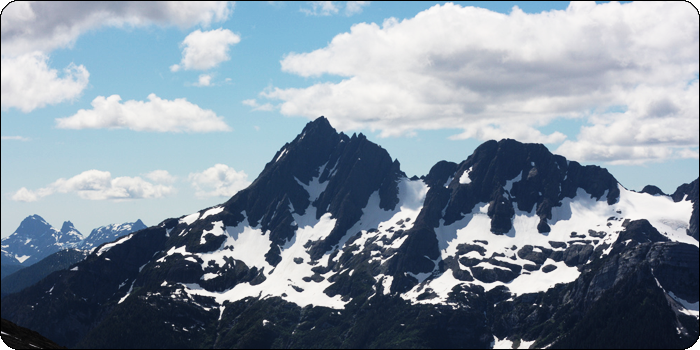 While the temperates immediately along the coast and in the rain forest usually sits about 10 or 15 degrees below that inland temperature, that is actually a blessing when trudging along with a forty pound pack in July and August. 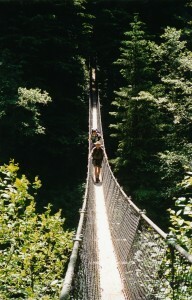 Cable Cars and Suspension Bridges: 5 cable cars and a half dozen suspension bridges span the five rivers along the trail that are situated in deep gorges. While the rivers are relatively quiet in July and August, in the fall and winder they become raging torrents and even in the summer, if there happens to be heavy storms in the area, they can quickly become impassible by foot. Ladders, Ladders, Ladders: I have no idea how many ladders there are on the West Coast Trail, but counted by separate, platform sections, they must number in the hundreds. Also, some of these ladders are in poor repair with missing rungs and broken supports. After going down a 100-150 meters at an 80 or 90% slope, you can walk for ten minutes on flat ground, then begin climbing that 100-150 meters out of the Gorge. A couple of laters seem to stretch 30 meters straight up. Rope Ties: On lesser slopes, say 60 or 70%, rope ties are often provided as in loose soil with few roots for support even in a canopy of trees, it would be nearly impossible to make headway without ropes. Also, it does not take many days on the trail to realize that climbing is much easier than descending, as on ascent it’s possible to keep a low centre of gravity when carrying a 40 or 50 pound pack, whereas on descent it is difficult to keep balance in order to get a firm foothold. While Parks Canada employees work to maintain the trails, it must be very difficult to keep ahead of the slash and blow downs that collects after each storm. 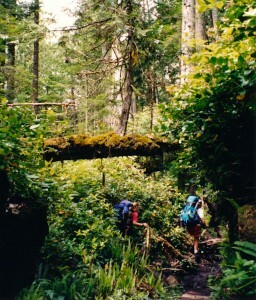 After hurricane force winds hit the area in 2007, the trail had to be closed for a several days while park crews cleared several blockages. Wooden walk-ways (some broken and in poor repair) also help preserve the fragile ecosystem of the area. As you will note in a few photo’s deadfalls have often been flattened with a chain saw, but, again, a covering of damp, slippery moss makes for a treacherous passage. In many other areas the trail is covered with blow downs, slash and flood wash that forward progress is slowed to a snails pace. Blocked headlands and heavy swells: While walking on the ocean’s edge is glorious even in bad weather, hikers must remain acutely attuned to tidal changes and giant ocean swells. When distracted by the amazing scenery, a hiker may suddenly realize the tide has sneaked in to cut off and advance or retreat. Photo: During a storm or high tide, this headland would be impassible as off the right the hiker is faced with an almost shear rock wall. There are emergency exits marked with orange cones, but taking these exits likely means a hard climb and some heavy bush whacking to get back to the main trail. 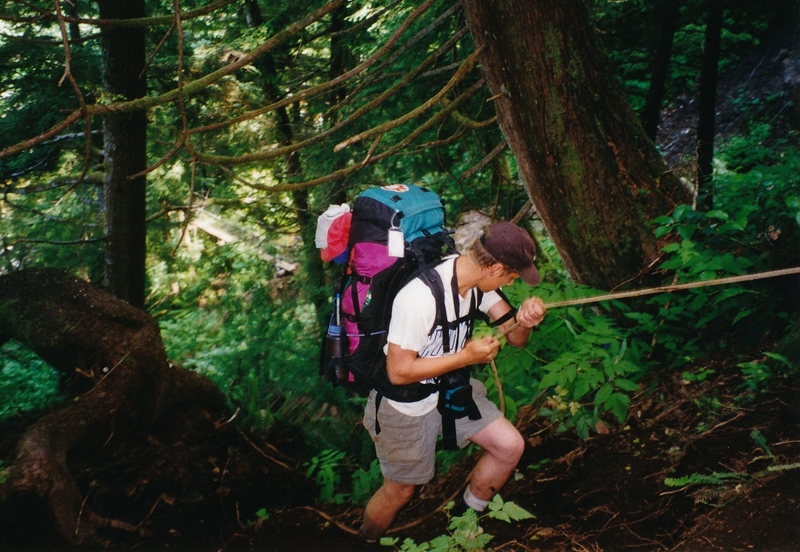 Whenever possible hikers will track several kilometers to safety rather than going off trail in the rain forest where making progress is a painful process. A hidden danger also exists after periods of heavy storms out in mid-Pacific. Large rouge swells can continue for several days and when they suddenly break on the shore can push the water 5 or 10 meters above normal. The unwary could be sitting enjoy lunch on a rock face 5 meters above the tide line and suddenly the water could be washing over your picnic table. Over the years, more than few hikers have lost their lives after being washed away in the frigid waters of the Pacific Northwest. Mud bogging. 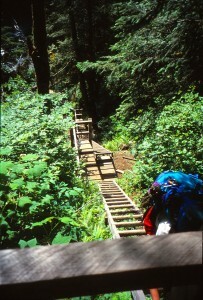 In several areas of deep forest, the main trail has broken down because of heavy traffic. Trying to avoid slogging through sometimes knee deep mud is impossible as the hiker could spend hours trying to pick their way around the edge form log to log, The time taken wouldn’t be worth the effort, so most just march on through, then wash and dry their boots, socks and pants at the end of the day. Loose sand and rock: While walking on table rock is pure joy, except in moss covered sloping areas, when a long stretch of sand or loose rock is encountered, the going is much more difficult than mud bogging. Surge Channels : Even at low tide, constant Pacific swell action can push a lot of water several meters up from the low tide line. When crossing these surge channels it is necessary to time to figure out when the swell action will be at a low point and then scramble across. Photo: It must have taken us the better part of an hour to navigate this surge channel. In the end it was David who managed to get a rope to the other side and that saved us from having to back track several kilometres. If the channel depression happens to be one or two meters deep, it is not just a simple matter of climbing down and then back out as the sides are often extremely smooth and the base is covered with slippery moss. Photos in the slide show (and on FB) demonstrate the method we used to cross one particularly deep channel. Note: if you were not tethered to a rope and happened to get caught in a surge you easily find yourself in a life threatening situation as you were washed out to sea. 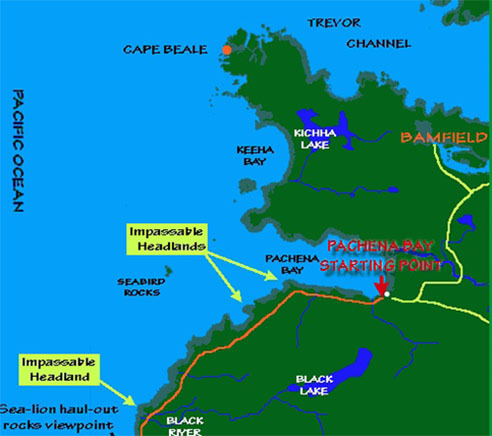 The cumulative effect of the above barriers, especially in poor weather, can easily add what might be the equivalent of 40 – 50 km kilometers to the total trek. When planning and wanting to include ample time to explore, consider 10-12 km. per day as the crow flies. That might be 15-20 km. in actual distance hiked between point A and point B and even that doesn’t count the time taken to explore at various scenic locations. Because cell phone reception was then and probably still is, very poor, injured hikers who are incapacitated may have to wait two or three days for emergency extraction depending on the weather. While only a small percentage of those who tackle the trail require rescue, on or two out of a hundred still keep our Search and Rescue people busy. When hiking in the off-season, October – March, the waiting time could be much longer. That means companions on the trail may need to attend to a serious injury or other medical difficulty as 600-800 people tackle the train each year. Having a skilled first aider in your group is a wise decision. Racing the Incoming Tide: At one headland (photo above left), passage is narrowed a area below a rock bridge. We arrived late and the tide and wave action had already partially blocked the passage. When swells came the water could quickly rise to waist deep. By timing it just right we could run around the end and down the safety of the next beach, but the time frame left no margin for error. I went first Kari followed immediately by Kari. David and Jenn would wait for the next opening. As soon as we reached safety I heard Kari use the ‘f’ word for the first time on the trek and in frustration she used it three times in quick succession “f” “f” “f”. “My goodness what happened honey?” In her rush to get around in that slippery sand and rock headland, she had dropped a new camera belonging to her baby sister. When the wave receded, I rushed back and found it, but even after washing it in fresh water at the next creek, it seemed that no amount of resuscitation likely to revive it. It would be best to peacefully bury it in the sand where it lost its camera life. Bears and Slugs: Bear warnings are often posted along the trail and camping in specific area’s may be prohibited. While bear attacks are infrequent, all campers must take care to protect food and gear from intrusions during the night. We were never bothered, but others along the trail made sightings and a few had even lost their food supplies simply because they were less than careful. Garbage and Toilets: Garbage in garbage. Hikers are expected to practice ‘no trace’ and one member of our party who shall remain nameless (Kari was her name), insisted on burning all traces of toilet paper when trailside toilets were not available. We finally convinced her that just digging a little hole in the moss and burying the paper along with the tiny droppings would serve the same purpose. 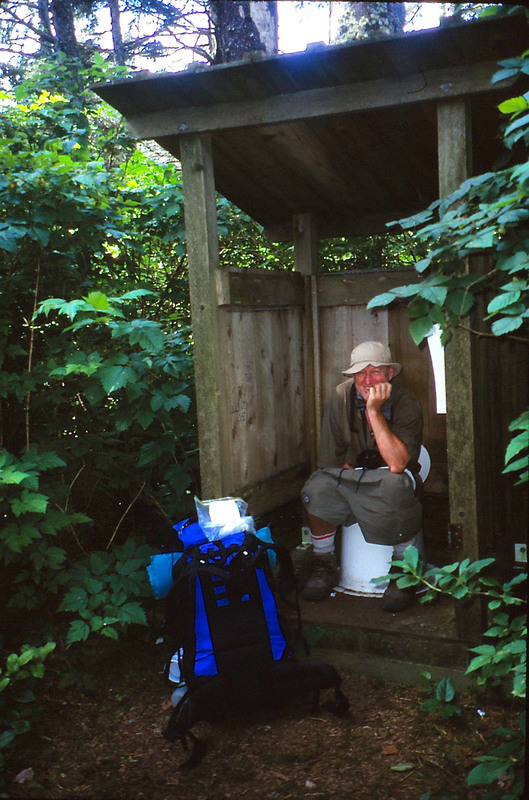 I did not include the two photos of my using trailside and beachside toilets in the slideshow, but have included them on the FB Page series. Headache: One the second day out the ache in my head and shoulders was constant and even after taking three or four extra strength Tylenol and consuming plenty of water, it remained. We first we attributed it to carrying that 45 pound pack, but even after the kids each took five pounds, it continued. It promised to be a difficult trip, but by early morning of the third day finally subsided, then disappeared. The kids piled my stuff (and some of theirs) in my backpack and we were off again. The likely cause – withdrawal from coffee. Wet Feet: Over the first day or two, we diligently removed our boots and socks and carried them across the many shallow creeks and flooded ocean areas, but because it took so long, by the end of the second day we just trudged on through. With good boots and wool socks, it made little difference. Putting on wet stuff in the morning was a different story so we tried to dry our socks at night. This caused a problem for David as he always put them to close and was running short of socks (see photo posted below). Neither was Kari immune from aches and pains. An old injury to her right knew left over from her field hockey days caused her a great deal of pain particularly when walking in loose sand and rocks. Each morning and a couple of times during the day, she had to tighten the stretch bandage to keep that trick knee in place. About three days in and after sliding down the side of surge channel (several photos in the slideshow and posted on FB), I noticed a stinging in my right buttocks. A couple of days later I downed my pants and Kari checked it things out. With a pair of tweezers she removed a large piece that had broken off a barnacle and imbedded itself nicely in my bum. Search for Fresh Water: It is not possible to carry sufficient water for the trip so each day it was necessary to search out clean streams and then to treat the water with iodine before drinking. Boiling is OK, but it takes more and uses up a lot extra fuel for not good reason. Each day near the end of our trek we would begin the search and fill up everything could before we pitched camp. Watching Kari on every ladder: Those dozens of steep ladders mentioned earlier, caused me a great deal of stress not so much for myself (it was just hard work hard work going up and down), but because I was fearful for Kari. She is shorter than I and has to work harder to get from one rung to the next. Also, she was carrying a good 50 pounds in her backpack and those stairs were often so steep, a persons body was being pulled away from the ladder rather than pushing into it. Whenever she encountered a point with a missing step, she almost had jump to make the next step. I always followed her and each time I watched her jump, my heart was in my mouth. Tsusiat Falls: This is easily one of the most scenic and delightful falls on the West Coast Trail. It was still in full flow in July so you can imagine what it would be like in early spring after those heavy winter rains. 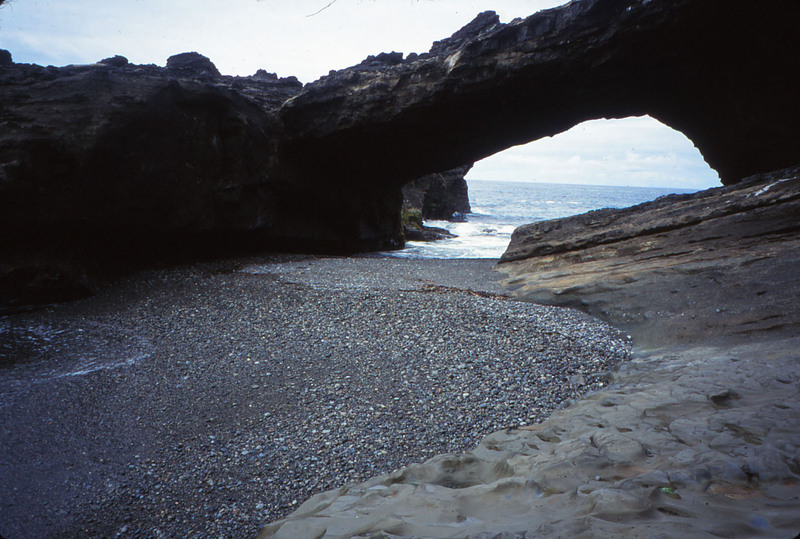 It was at Tsusiat Falls they have a toilet that is open to the magnificent Pacific Ocean. Oh, and on leaving the falls, you need to climb about 40 meters back up to the trail. Canadian Forces Two Day, Overnight Run: You may have noticed a half dozen Canadian soldiers spread throughout the slideshow. They were dressed immaculately with highly polished boots to match the rest of their gear when they left for their two-day run to Pachena Bay. I would love to have loved to capture a few photos when they arrived. We only saw them at the beginning, but I sprinkled their photos through the slideshow. 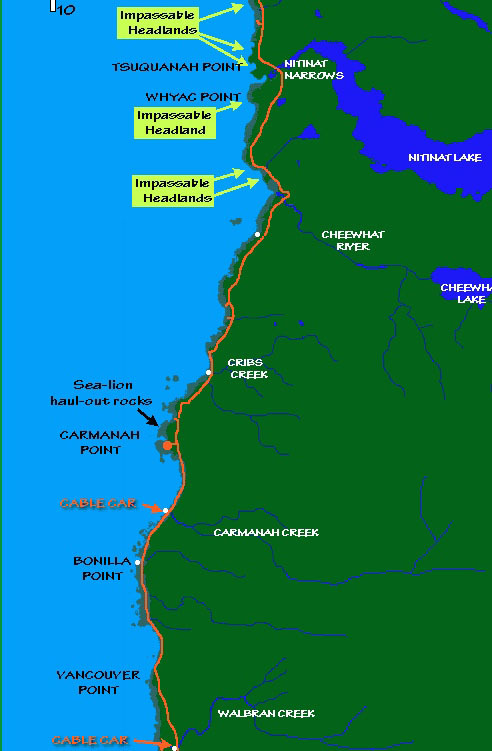 Because various web sites provide exceptionally good information about hiking the West Coast Trail (a few links are provided below) this post has mainly covered the challenges we faced and humorous anecdotes that occurred along the way. Perhaps after reading the post, Kari, David and Jenn may wish to jog my memory with a few anecdotes of their own. Just shoot me a message kids and I will add. Thanks for a wonderful trip down memory lane Dad!!! That was an amazing trip and I am so glad that we had the opportunity to share that experience together!